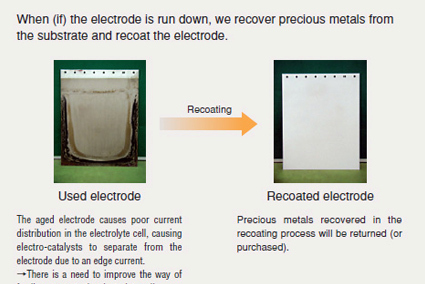 Electrodes with plating thicknesses from 0.1 µm to several hundred µm are available depending on the current load. * The most suitable electrodes are provided to match the application such as chlorine generation, polarity reversal and high current density. Case Study:Just when you thought there could be no further productivity improvements and cost reductions. What sort of plating can reduce production line downtime to one third?